A thin pliable reinforcing fiberglass mesh that lays flat to form an invisible patch made of unbeatable strength & holding power. Easy to use. No bunching, bulging or stiff loose hairs to ruin your finish. 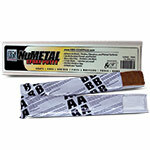 Use in conjunction with RustSeal or NuMetal to repair holes and bridge gaps in metal, wood or fiberglass. BackBone is a thin pliable reinforcing fiberglass mesh that lays flat to form an invisible patch made of unbeatable strength & holding power. BackBone is easy to use. 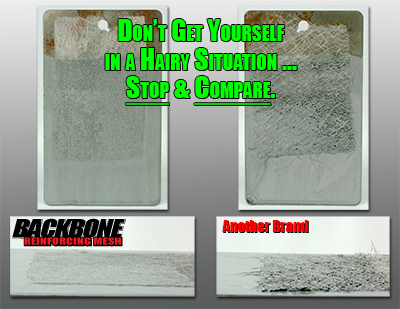 No bunching, bulging or stiff loose hairs to ruin your finish. 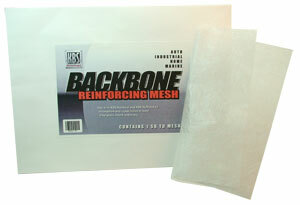 BackBone can be used in conjunction with RustSeal or NuMetal to repair holes and bridge gaps in metal, wood or fiberglass. Experience the difference with KBS BackBone Reinforcing Mesh, a soft, thin, flexible, reinforcing fiberglass cloth with amazing strength and holding power. Each packet contains 1 square yard of BackBone which is specifically designed to bridge gaps and repair holes and add a layer of additional security. Apply BackBone to metal, wood or fiberglass using KBS RustSeal for unmatched protection and coverage. Your repair will stand up like a champion! Please Note: There is one large piece of cloth in this envelope. Do not handle mesh with bare hands. Always wear gloves when working with BackBone. As you cut the cloth, fibers may fly into the air. Please wear a mask while cutting BackBone. The thickness of the product allows you cover areas without his built up. You can coat it several times and it levels out to a smooth surface.I used it on rust spots in my floor boards, also covered bolt holes i didn't need in trunk firewall alot less work than welding. Don't get the color on your skin.It will be there for a long time. My welder said this is beautiful. He saw it before the treatment and it was covered with holes. After the 3 step treatment and fiberglass covering was applied and painted on the trailer looked GREAT! The welder could not believe it was the same trailer. Working with KBS Backbone was not just easy but also most satisfying. I am trying to repair a 1969 Jeep CJ 5 and the combination of this mesh and the KBS coating turned out to be a perfect match for my project. I had my 19 year old daughter watching me work and as soon as she saw my first application, she took over from me and completed patching all the holes on the floor. Her work turned out just like mine - par excellence! Thanks to KBS. This stuff worked well. It laid out nice and flat and did not come apart. I have used some mesh from other companies and it is always so hard and messy to work with. This stuff was easy to work with and ended up looking great. Q: what is the size of this? A: 1 Square yard. (36 inches by 36 inches). 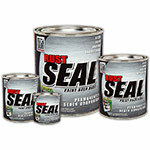 RustSeal is a superior single part, ready-to-use, rust preventive coating. RustSeal is impervious to road salts and most every chemical. RustSeal flows out to a beautiful, rock-hard, tough ceramic-like coating that is tough to chip or scratch, and will not crack or peel. The Trunk and Floorpan Repair Kit is a restoration kit that will save you money versus the cost of replacement. Restore your floor pan, trunk, or pickup truck bed back to new and never deal with rust again! Easy-to-follow detailed instructions included.